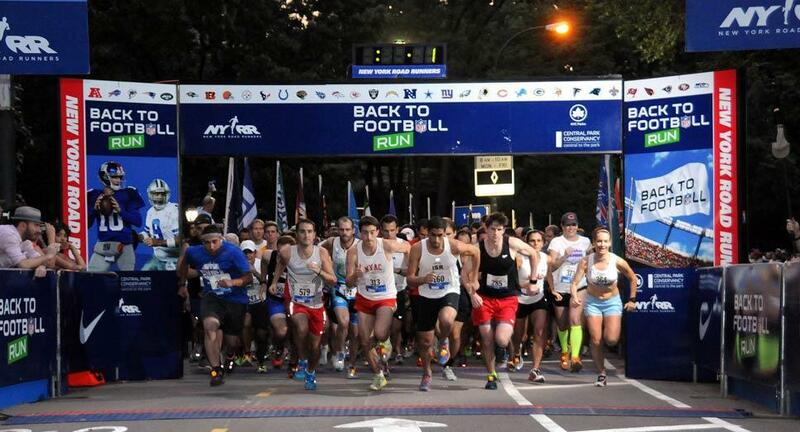 Last night I ran in the NYRR's NFL Back to Football Run. This race was number six on my road to the 2013 ING New York City Marathon. I was anxious about this race. While I try to focus on finishing, setting a good pace means alot to me as well. When I started running back in October (more like walking with a hint of a run), my pace was around 17/18 minutes per mile. A sistah was struggling, but vowed to be consistent. In my most recent races, my pace improved to 14-15 minutes per mile. It was okay, but deep down I wanted to break 14 minutes. I planned to achieve this by working on my speed. The goal was to stay below 13 minutes during my weekly runs. It was very uncomfortable and challenging. However, I pushed through it. As soon as I got home I checked the race results. I set a new personal best. My pace was 12:56. YES! I felt all sorts of good. "In the interest of safety, any participant who is unable to maintain a 14:00-per-mile pace throughout the race (2:20 projected finishing time) will be picked up along the course, starting at approximately mile 6, and transported to the finish." Now, I'm not gonna lie -- running 10+ miles intimidates the hell out of me. However, the thought of being transported to the finish...smh. Consistency and goal-setting helped me achieve my Back to NFL run , and I pray the same goes for next week. Otherwise be prepared to see photos of a 'Transported Lizzie' finish. lol. Have you achieved a race pace goal? I'd love to hear all about it. Until then, take care and have a Happy Labor Day Weekend!